Ingrid Herbert, R.R.Pr. Reflexologist, Shiatsu Therapist, Reiki Master, Holistic Health Care Practitioner & Yoga Instructor. Experienced in the holistic health industry for over 15 years as a practitioner and educational faciltator, Herbert has offered numerous seminars and workshops for many youth and adults audiences. For over 15 years, Ingrid Herbert has practiced as a Health & Wellness Coach, Shiatsu Therapist, Certified Reflexologist, Reiki Master, and Yoga Instructor. 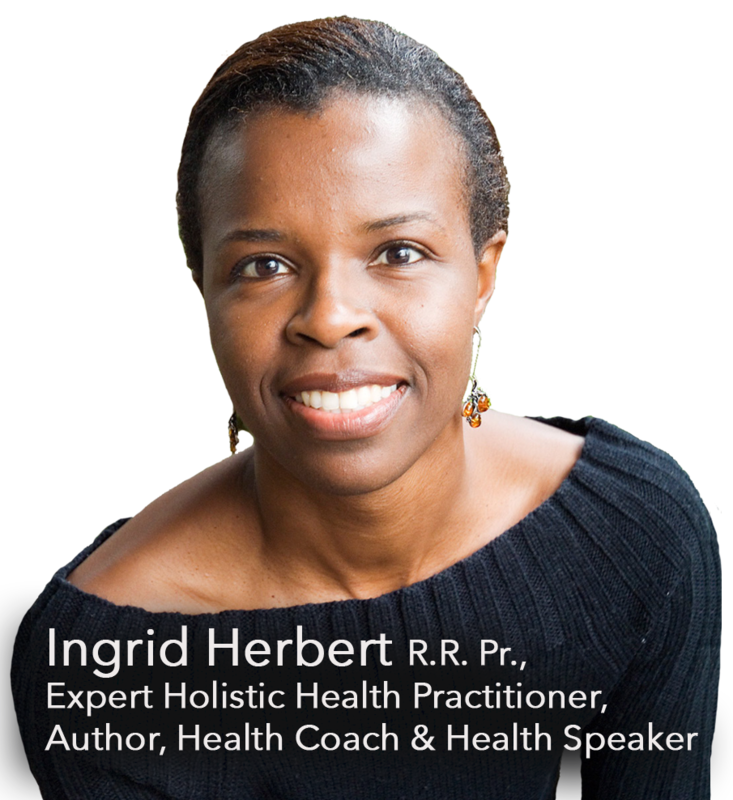 Ingrid facilitates speaking events and workshops that address clients health and wellness needs. She uses a comprehensive strategic approach that includes nutrition, a balanced lifestyle and stress management. She shares her knowledge and 15 years of experience as a private holistic practitioner during these talks with a positive yet whimsical attitude. Using a “less is more” strategy, she focuses on creating actionable steps for stress reduction, time management and personal well-being. She co-founded, The Warrior Princess, a charitable organization that empowers marginalized and at-risk young girls and women to manage their personal health and life goals. Customer service is to give more than expected. Taking care of customer needs by listening and then delivering on what they want. Wellness to Go assists individuals, couples, and families by providing consultations, treatment plans, & workshops that create immediate results of better health, mental clarity and support for health challenges. To be recognized as a leading authority in the alternative Health & Wellness industry by inspiring individuals, couples and families to strive for better health mentally, physically, spiritually and emotionally on the planet. “I left Tobago when I was 6 1/2yrs old. I remember getting off the plane and feeling my doll becoming cold in my hands. In grade three I was drilled about my accent, which until then I didn’t know I had. I was sent to special classes where there were other kids with accents to learn to speak like a Canadian. By grade 6 I had endured years of ridicule by kids asking questions about my hair texture, skin colour, and where I came from. I don’t know when it happened but it did, the criticism started to affect my self-esteem. My health issues started at the onset of my period, which magnified my lack of self-confidence. My doctors experimented with different treatments and medications that were temporary fixes at best but with no actual solutions. For many years I lived in a permanent health crisis, which cost me jobs, friendships, and relationships. I had what I called a half-life. Eventually I found my breakthroughs with alternative treatments, which I coupled with medical monitoring. Many of us go through difficult hardships and challenges within society. My goal is no matter the circumstances that you are faced with I want to help you get the opportunity to live your life fully. 2018 Author of the upcoming book: Creating Sacred Space, a Journey to Self-Healing & Living the Life of Your Dreams! 2014 Continuing to work with kids at TDSB. 2013 Introduced yoga for kids into CLP licensed After School Programs. In May 2007 she was the 2nd prize winner in the “Keep it alive – Start a Conversation” Contest put on by the African & Caribbean Council on HIV/AIDS in Ontario (ACCHO) 2007, for her literary piece titled ‘Difficult Conversations’. She wrote with the lifestyle section of ‘The Connection News Magazine’ from 2005 – 2006. She successfully showed at the ‘Holiday Festival’s ‘ group show with Cobalt Gallery in 2007 and the Trade show: African & Caribbean Treats & Treasures at the North York Civic Centre – in support of Second Chance Scholarship Foundation. Developed the pilot project ‘The Warrior Princess’ which was officially launched in 2008 through Rise Up Outreach. Facilitated at Evas Phoenix, Women Shelter based in Toronto. To inspire and educate individuals to rejuvenate their bodies, enrich their minds, and nourish their souls. We are in a constant state of change as we strive for equilibrium to fight stress that affect our well-being everyday. These stressors affect our body, organs, skin and emotions. Bringing our bodies and emotions back into balance is the purpose of achieving optimal health. Over the last 15 years I have treated a multiple assortment of ailments such as asthma, hip & knee replacements, broken wrists, fingers and knee injuries. In the more recent years I’ve dealt with various cancer’s, strokes, MS, and Erb’s palsy (paralysis), all of which clients have had very positive results with each particular treatment course of action taken. I promote the importance of balance and well-being, through various modalities of treatments and feel privileged to bring this gift of healing to you. I’ve learned that the most important step in anyone’s healing is their belief and acceptance of a possible solution. Improved health, commitment, positive perceptions and expectations empower individuals to make healthy lifestyle choices and allow them the freedom to be. Cheers to a beautiful you!